Q. What is scaling ? Dental health is an important part of your general health. Whatever your age, you can and should have healthy teeth. Correct dental care can help you keep your teeth healthy for a lifetime. Scaling is one such procedure that keeps your gums healthy and firm. It is a procedure used to remove infected deposits like plaque, calculus and stains from the tooth surfaces. Such deposits, if not removed by scaling, cause infection and loosening of the gums, ultimately leading to pyorrhoea and tooth loss. Scaling is a safe and routine procedure and does not damage the tooth surface in any way. It must be done by a dental professional. Scaling with hand-held instruments. Your dentist or periodontist will use a dental scaler and curette to manually remove (scale) the plaque from the teeth. Because the dentist or dental hygienist can't see the plaque, they rely on touch to identify areas of tartar buildup and rough spots. Scaling with ultrasonic instruments : - Ultrasonic scaling instruments clean plaque from the teeth with a vibrating metal tip that chips off the tartar and a water spray to wash it away and keep the tip cool. Ultrasonic scaler from ems that we use in our dental mumbai clinic, is efficient in breaking and reducing heavy tartar. But hand scaling is always followed by our dentist in mumbai after ultrasonic scaling. There different design of tips available for cleaning tooth surfaces and for various needs are available. Q. What is a plaque ? Dental plaque is a soft, sticky, colorless film of bacteria and food particles that constantly forms on the teeth. The bacteria colonize and multiply rapidly in this film and initiate infection in the gums, often resulting in tender bleeding gums. If dental plaque is not removed within 10-14 hours by brushing, it mineralizes into calculus or tartar. Calculus once formed cannot be removed by brushing and has to be removed by scaling by a dentist. Q. Why is scaling done ? Regular tooth cleaning by the dentist is important to remove calculus or tartar that may develop even with careful brushing and flossing. Professional cleaning includes scaling and polishing. Scaling is a common non-surgical treatment for removal of infected deposits - tartar or calculus - from the tooth surface. 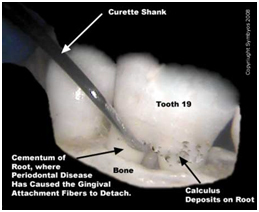 These deposits if not removed lead to periodontal disease. In periodontal disease, the pocket between the tooth and gum begins to deepen. This provides a perfect environment for anaerobic bacteria to grow. The bacteria begin to multiply rapidly and infect more of the gum and start dissolving the bone supporting the tooth. This leaves the tooth progressively loose. The treatment now becomes more extensive and complicated in order to save the tooth. Surgery of the gums is required in order to make the tissues around the tooth healthy. Q. What is the procedure ? Scaling involves a deep cleaning of the tooth above and below the gum line in order remove any plaque and calculus that has accumulated on the tooth. This involves the use of special instruments and/or devices to loosen and remove deposits from the teeth. Commonly an ultrasonic machine is used. It has a fine tip which vibrates at ultrasonic frequency and which dislodges tartar and plaque from the tooth surface. As the vibrations are extremely fine the process does not damage the tooth surface in any way. Your dentist will also schedule a follow-up appointment in the next 4-6 weeks to check on your improvement. Many dentists recommend having the teeth professionally cleaned at least every 6 to 12 months. More frequent cleaning and examination may be necessary during the treatment of many of the dental/oral disorders. Routine examination of the teeth is recommended at least every six months. 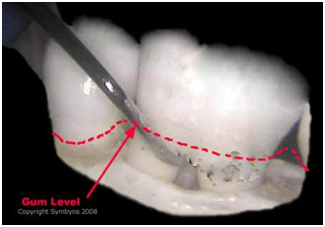 Figure 1a: Scaling & root planing procedures are performed below the gum level on the root surfaces of the teeth, where the damaged gingival and periodontal ligament fibers once attached to the tooth roots. Specially shaped "curettes" are used to remove the diseased cementum and calculus deposits, which support bacterial colonization. Figure 1b: Note that the bone level has receded, allowing the "furcation" area to be visible (where the tooth divides into separate roots). Normally, the furcation would be submerged in bone, and inaccessible to bacteria. Periodontal disease has caused the bone to "dissolve" away in the acidic environment created by bacteria and chemical agents of the body's immune system. For a few days after the scaling and root planning is performed, you could experience soreness, and sensitivity to heat and cold. You can use a non-prescription pain reliever to remedy this situation. Your dentist or periodontist may also ask that you use an antibacterial mouth rinse after the scaling and root planing. This will be helpful for sore gums and also as an efficient oral hygiene measure. But, make sure that you continuing to brush and floss. You may also experience small amounts of bleeding for several days following the procedure, but this usually subsides rather quickly. Q. What is the outcome ? Good oral hygiene prevents, and is vital to the treatment of many of the dental and oral disorders. Good oral hygiene results in a healthy mouth. Moreover, the mouth is the gateway to the whole body. a healthy mouth ensures a healthy body to a great extent. Depends on whether your mouth is reasonably healthy or a fungating mess. The more neglected your mouth is, the greater likelihood of there being some tenderness as all that yucky stuff is removed. Our hygienists are nice ladies and they will tell you about the pain control techniques that are available. Q. How frequently should scaling be done ? Plaque formation on the teeth is a continuous process. If this is not removed by brushing it starts mineralizing into tartar within 10-14 hours. Such persons may require periodic scaling, every 6 months or so. The golden rule is to have a routine dental check up every 6 months. Your dentist will be able to advise you whether you need scaling or not. He will also advise you on the correct home care for healthy teeth. It must be emphasized again that scaling of teeth does not weaken them but prevents gum diseases which bring about bleeding gums and if not checked leading to more serious and extensive gum problems.